2014 - Lecturing in Traditional music on an all-genre music module for the USIT International Summer School, Trinity, College Dublin. 2011–2003 – Lecturer in Irish Traditional music, Dundalk Institute of Technology, Co. Louth. 2011-2009 – Lecturer in Irish music on MPhil Irish Film, Music and Drama, Trinity College Dublin. 2010-1996 - Lectures on Irish music and performance for International summer schools at Trinity College Dublin. 2009-10 –Irish music modules devised for Trinity College, Dublin’s MPhil in Irish Film, Music and Drama. 2004 Origination and teaching of distance-learning modules on Music and Borderlands on joint University of Ulster / Dundalk Institute of Technology, web-based degree in Borderlands Studies. 2003 07-08 Design and delivery of module on traditional music for New York University’s Irish Studies summer school at Trinity College Dublin. 2003 - 01 Appointed Lecturer in the Regional Musics of Ireland at University of Ulster’s Irish studies unit Academy for Irish Cultural Heritages [AICH]; teaching module in Traditional music to BA and B Mus students at University of Ulster. 2001-1999 - Devising and teaching a six-semester programme (years 1-3) in Irish Traditional music with Ethnomusicological overview at St. Patrick’s Teacher Training College, Drumcondra, Dublin. 1999-1994 - Development of courses in, and lecturing on, 1/ Ethnomusicology (to final year Anthropology); 2/ Irish Traditional music (2nd year Music); 3/International Folk musics and Ethnomusicology (3rd year Music) at National University of Ireland, Maynooth. Oisín Mac Diarmada, The Shapes of Melody – Music and Movement (not completed) Funded programme, Strand 1. 2014 06 - Traditional music module on an all-genre music module for the USIT International Summer School, Trinity, College Dublin. 2008 01 Postgraduate Seminar, International Council For Traditional Music. 2003 04 23-27 . Crosbhealach an Cheoil - The Crossroads Conference - Education in Traditional Music. A major international conference held at Magee Campus, University of Ulster, Derry. 2003 02 22 Swinging Shoulders, Dancing Feet – Music Traditions among Protestant People in Ireland, day-long seminar, UU York St. campus, Belfast. 2003 01 31 High Road and Low Road’, concert of music and song to celebrate Robert Burns, Magee campus UU, Derry. 2002 10 ‘Singing the Walls’ - a tribute to Eddie Butcher. Concert of Traditional singing from Ulster, Lowland Scotland and England, Magee campus, UU, Derry. 1996 04 23-27 Initiating organiser of, and committee secretary of Crosbhealach an Cheoil - The Crossroads Conference, a major international forum on innovation and change in Irish Traditional Music; 40 papers, 300 delegates, Dublin, Temple Bar Music Centre. 1992 03 Organisation of exchange group of Bulgarian Folk musicians performing throughout Ireland: concerts, TV, radio, schools (four weeks). 1989 - Co-ordination and organisation in Miltown Malbay, Co. Clare of museum project of Traditional music, instrumentation and transmission. 2013 - Extern examination, Post-grad Traditional music performance, Dublin Institute of Technology. 2008-2003 External Examiner for Traditional music BA, MA & BMus programmes, Waterford Institute of Technology. 2005 + (occasional) - Member of Assessment panel for Deis, Irish Arts Council Traditional music awards scheme. 2005 –1998 Member of selection panel for TG4 Gradam Ceoil - National Traditional Music Award. 2004 Consultant to Library of Congress, Washington DC Ireland Exhibition 2007 project. 2003 Member of Arts bursaries assessment panel for Co. Mayo Local Arts Office. 2002 Report - The Arts Council, Local Arts Offices, And Support For Traditional Music’, Dublin, The Arts Council / An Comhairle Ealaíon. 2000 Member, assessment panel for NCEA (National Council for Educational Awards) r/e Institute of Technology, Tralee’s Traditional music programming School of Business Studies and Social Studies. 1998 Design of integrated Traditional Music/Ethnomusicology course for Siamsa Tíre, Tralee project with Co. Kerry VEC. Emir - The Encyclopedia of Music in Ireland - review commentary and statistics. 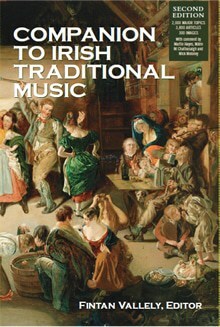 Articles on Irish Traditional music appear in various media from 1994 onward. These begin with a column in the now-defunct Evening News, previews and album and live gig reviews in The Irish Times(1994-2002), a series on musicians in Irish Music magazine, and a weekly column and album reviews in The Sunday Tribune (1998-2002). There are also academic articles in various Irish Music journals, including Journal of Music in Ireland / JMI, album sleeve notes and conference and other programme preambles. Selected feature subjects: ‘World music, British Folk Festivals, Lambeg Drum and bodhrán, Irish music in Italy, Piping links with Sardinia, the cultural and economic background to Riverdance, the controversy of copyright royalty collection in Traditional music, Traditional music status, education and Summer Schools, governmental intervention in traditional music, the fleadh cheoil. 2002 - 1998 The Sunday Tribune - Weekly Traditional music column and album reviews (). 1999 - 1994 The Irish Times - regular Traditional music features correspondent, and performance and album reviewer (). 1996 – 1994 Irish Music magazine - Traditional music features and album reviews. 1994 Evening News - weekly opinion column on Traditional music (1994). 1999-1995 Irish Press, Alpha, Circa, Irish American Post (Milwaukee), Ireland Guides (Dublin, multi-lingual publication); Inside Ireland (Dublin/USA) - features and opinion.